Home Trip Report How Do You Witness a Place? 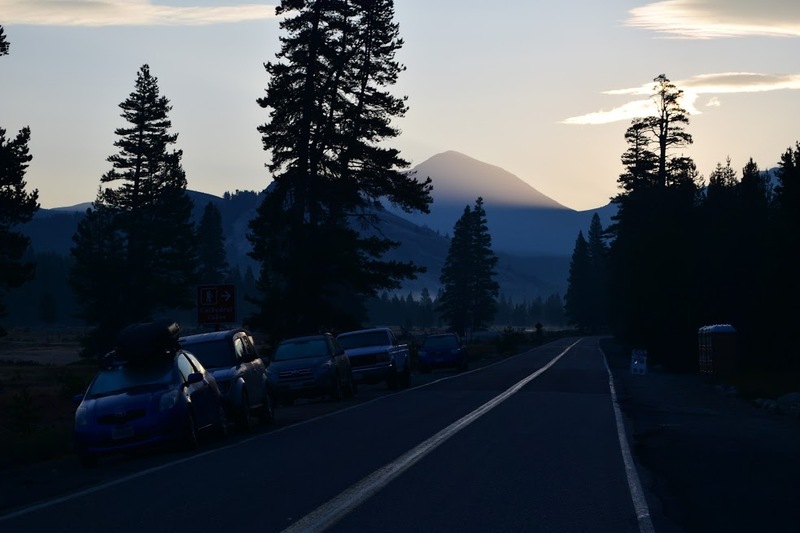 A National Park like Yosemite offers a myriad of opportunities to engage its beauty and come to to know the different aspects of its character – but where to begin? 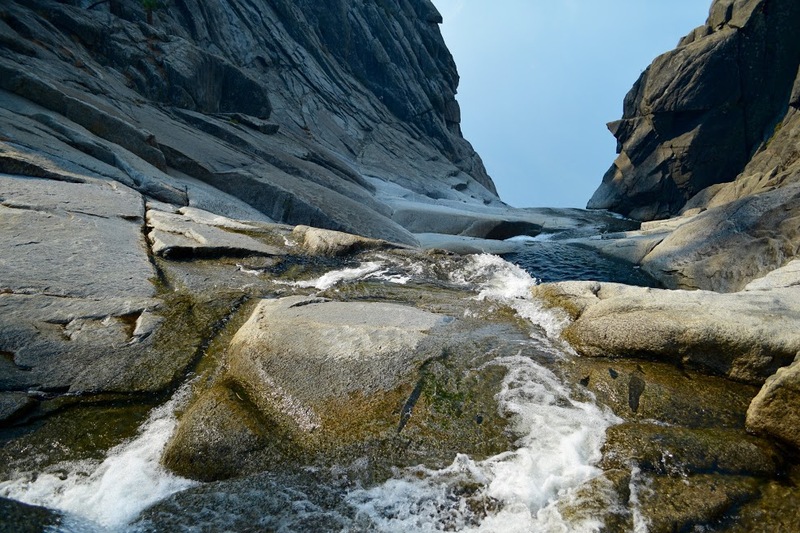 Friends of mine have traveled across the country for the unique whitewater experience of snowmelt down steep granite. 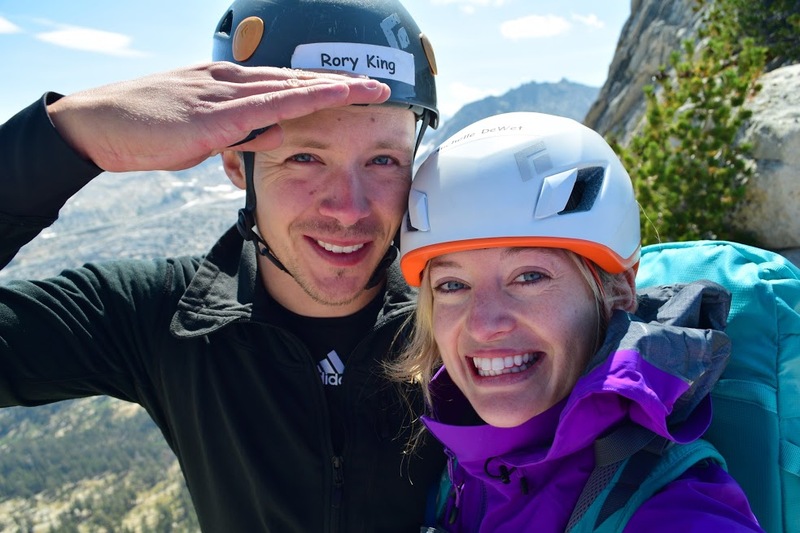 Others have made the pilgrimage to the world-renowned big walls of El Capitan for ambitious ascents like the Nose-in-a-day or to spend an entire summer aiding their way up innumerable valley classics. 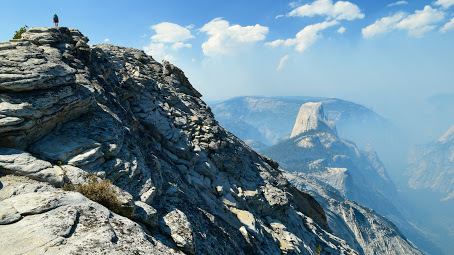 Besides these, Yosemite is also a mecca of opportunity for hikers, backpackpackers, canyoneers, and mountaineers alike. There are so many facets to this one park and it’s so highly revered in each of these circles, that I had to come see it for myself. We surprised ourselves. Movement felt good and our days averaged 16 miles and almost 4,000’ climbed. 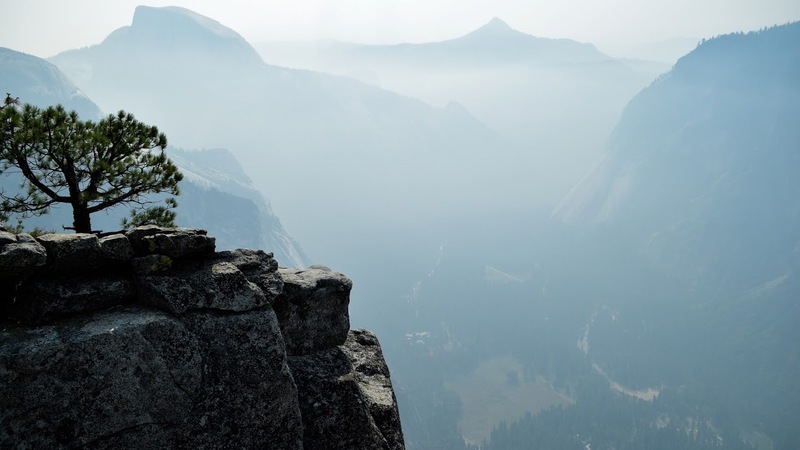 How better to appreciate the terrific scale of the Yosemite Valley and the surrounding High Sierra than by climbing into and out of it, by your own volition, one step at a time? Originally we’d had our eyes on some easy multi-pitch classics, but nerves (mine) and injury (hers) got the better of us. We left the rope behind and did our climbing with legs and lungs instead. This would be a long one! Michelle and I climbed up to the North Rim of the valley on the Upper Yosemite Falls trail. We moved quickly on the ascent and figured we’d earned a breakfast stop at the teacup pools of Yosemite Creek, right before its spectacular plunge to the valley floor. The granite bedrock resisted the scouring of glaciers, but this little creek has been at work on it ever since. A very special little spot with it’s smooth, scalloped cuts and the beckoning void beyond. The plan had been to visit North Dome, but we opted to bypass it as we could hardly see across the Valley through the smoke. This took us into much quieter territory. We interrupted a covey of blue grouse and even startled a black bear! They’re remarkable (and quite frightening) to behold in the wild. This fella was cinnamon-colored and just rippled with muscle. That encounter won’t be forgotten any time soon. Rest day summit? Yes please!! Mount Hoffman allegedly offered one of John Muir’s favorite vistas of the park – that was more than enough to get me on board. A faint climber’s trail leaves from the SW corner of May Lake and climbs another 1500’ or so to the summit. We followed it through some tedious boulderfields, until it opened up on a wide bench. I’m calling this “Marmot Saddle” because the little guys were everywhere and totally unphased by our presence. If you’ve never seen a marmot pup, let’s just say you’re missing out. We climbed the Class 3 slabs to the summit and just tried to take in the magnitude of where we were. 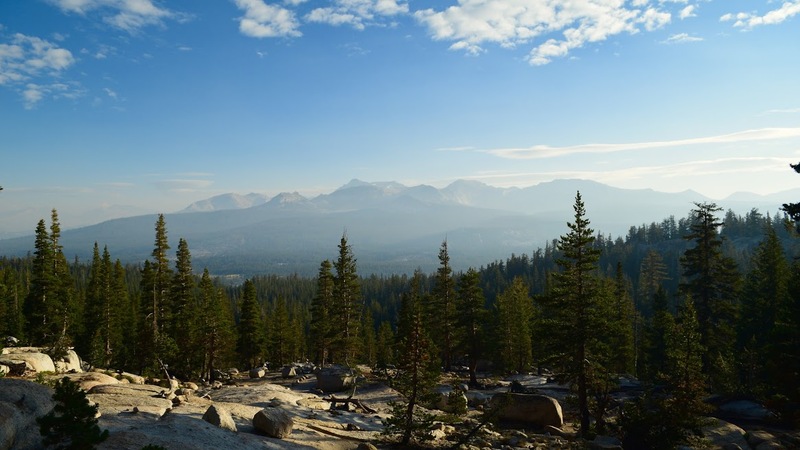 From this vantage you could name upwards of 60 high sierra peaks, the tallest still carrying snow. Some weather began building behind us, and regretfully we hustled back down to treeline. 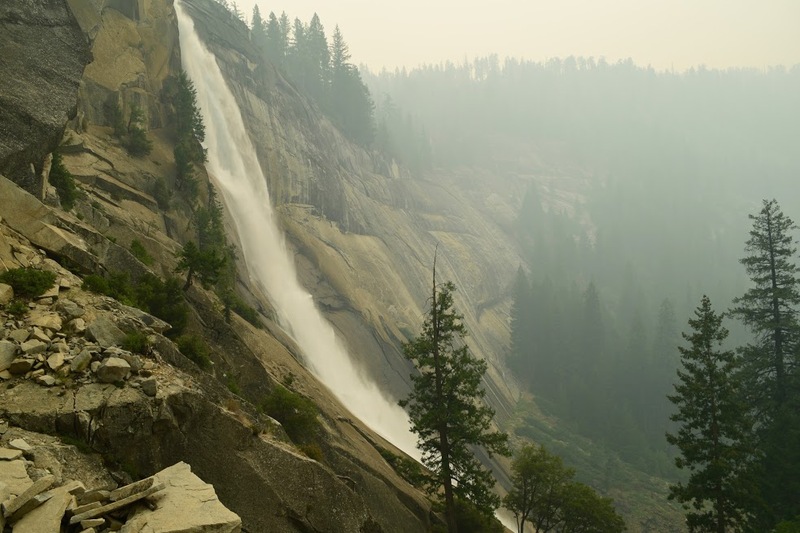 Nevada Falls in heavy smoke. The smoke advisory felt real this day. 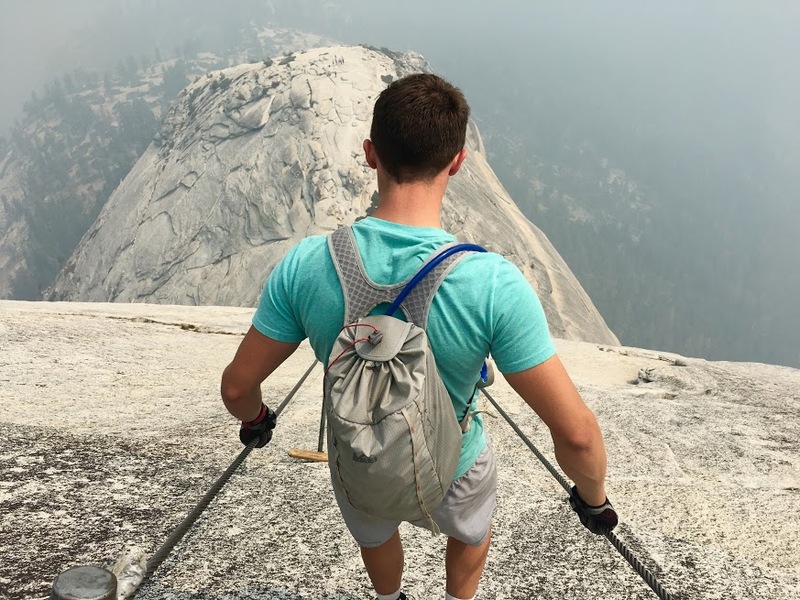 I can’t remember the first time I thought about climbing Half Dome – it seems like it’s always been in the back of my mind. Originally we planned to summit via Snake Dike (5.7), but I was scared and once we won the cables lottery, the choice was pretty easy. We set off on foot with just enough light to leave our headlamps behind. Sunrise through the morning’s dense smoke created the most surreal salmon pinks and fiery oranges. That orange cast lingered strangely until midday. 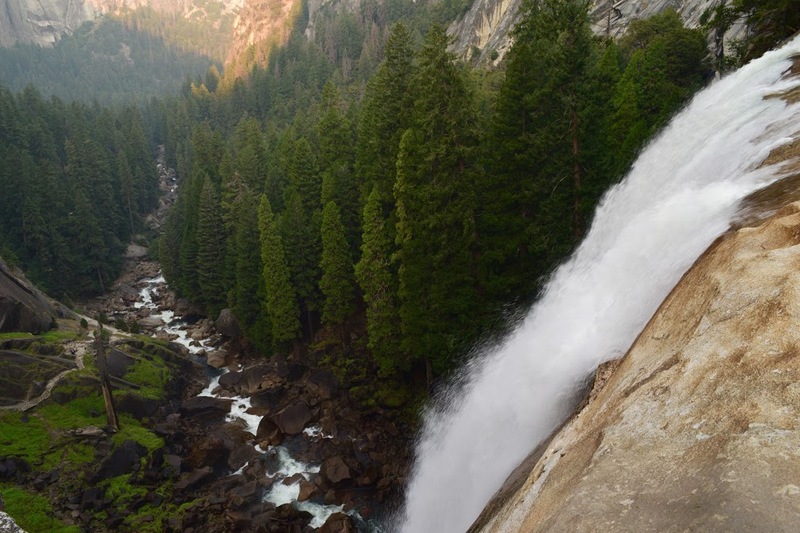 We traveled up Mist Trail past Vernal Falls to Nevada Falls, the most popular trail in the park. 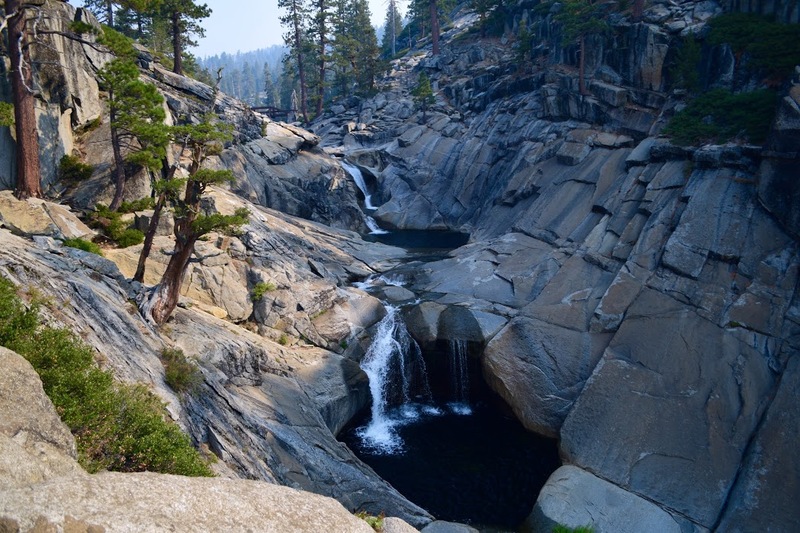 It ascends the Merced canyon on a trail of hewn ledges and steps blasted into the granite bedrock. It’s an amazing place and an equally remarkable trail constructed through it. The next bit drug on. 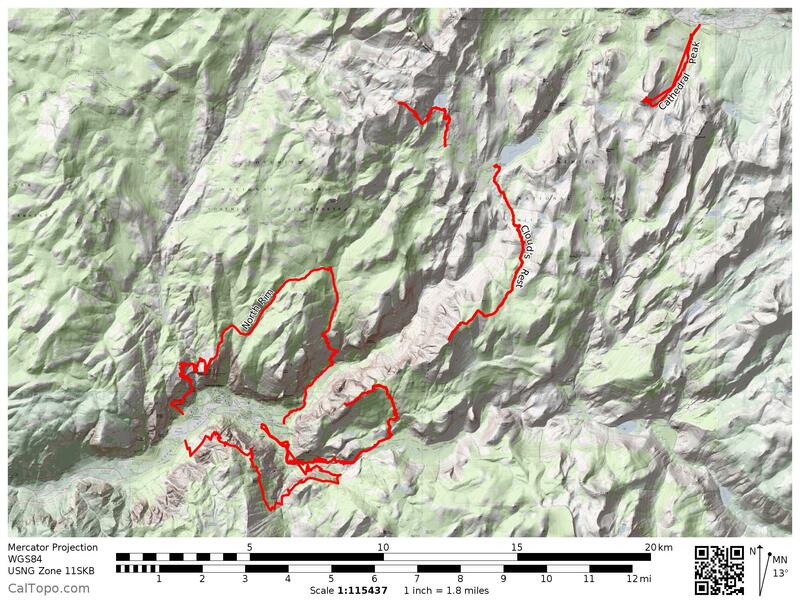 We climbed up out of the Merced canyon and past the climber’s trail for Snake Dike. The smoke was thick and made it difficult to breathe. Eventually, we made it to the sub-dome and started up it. I can’t even imagine how much effort must have gone into the construction of this section of trail. 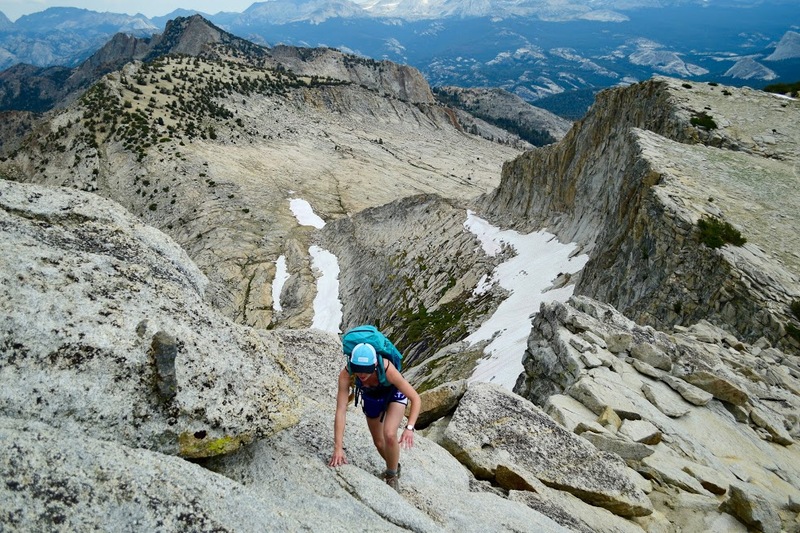 It ascends about 400-500 feet of otherwise technical climbing on cut steps and relatively moderate grades. Then, the cables. Descending the Cables - don’t forget a pair of gloves! 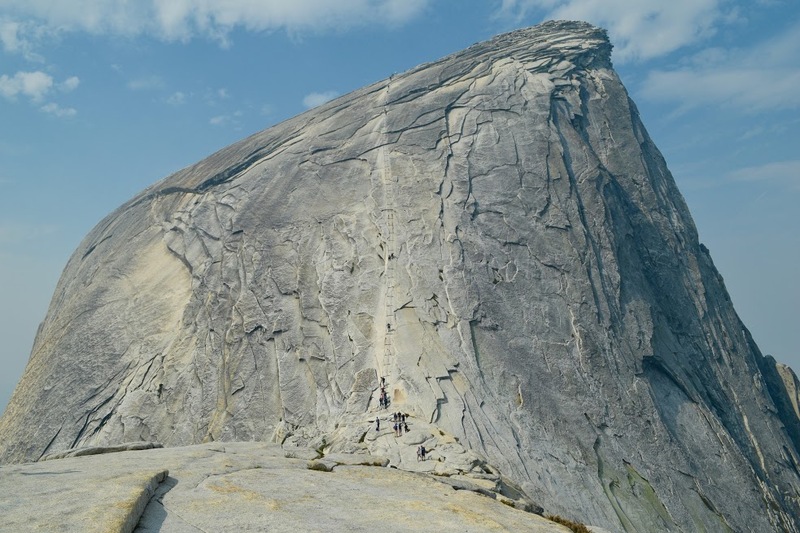 It’s pretty wild to think that the Park Service went through all the trouble of drilling holes and constructing the cable system to allow non-technical access to Half Dome’s summit. I have mixed feelings about it, but I do think there’s an important admission in all that work – that these are special places, and that there’s a richness in experiencing them. 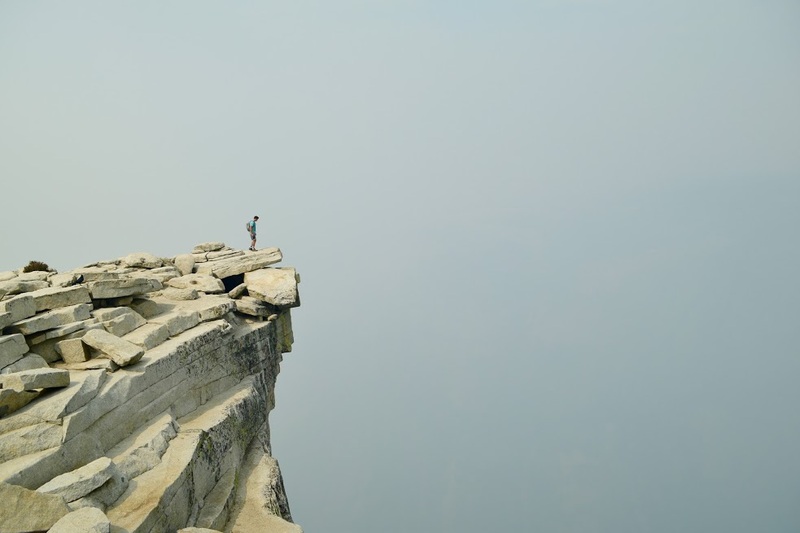 I’m happy that almost anyone can climb to the top of Half Dome…I just wish they weren’t all ahead of us in the queue. Climbing the cables was far more a spectacle than a highlight for me. Tuolumne Meadows just before dawn. There was frost on the cars at the trailhead. The view from the steeple. That’s Budd Lake on the left, Cathedral Lake on the far right. Look for Half Dome in the background! Lunch in the spot of sun we found after getting ourselves safely off the slabs. Cathedral Peak’s SE Buttress (5.6) is on just about every climber’s short list for its superb granite and remote High Sierra locale. I was pretty psyched to give it try but also quite apprehensive – this would be our first time attempting this style of climb. We let it go for a variety of reasons, but I was still itching to see the area. We ended up climbing what is normally the descent, a nontechnical class 3 to class 4 route which wraps around the mountain’s North face. The route was tremendously enjoyable, with fun, secure climbing all the way to the top (well, just shy of the top). The last couple moves to the summit were more demanding than we cared to climb unroped, so we made the most of our little perch about 15’ below the true summit. This area of high, craggy peaks might be my favorite in the park. They’re breathtaking and so different than the polished domes that decorate the landscape a few thousand feet below. I can’t wait to revisit this massif of Unicorn Peak, Cathedral Peak, the Echo Peaks, and most notably the Matthes Crest. The wildfires certainly changed our experience in the park, but it’s important to remember that that fire is a part of the natural history here. Over Michelle’s shoulder is the evidence of a 2010 burn. Cloud’s Rest was hands down my favorite destination. It gives the most remarkable perspective of Yosemite Valley, and it’s like the whole glacial history of the area is just laid bare before your eyes. 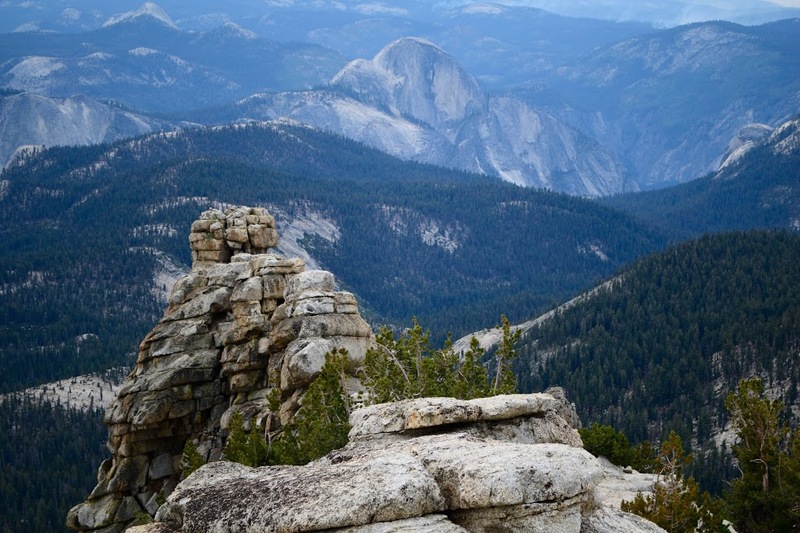 Cloud’s Rest sits higher than Half Dome, and squarely between the valley and its High Sierra origins. 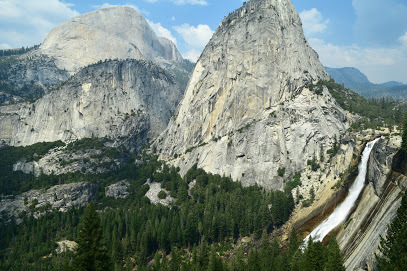 It’s not hard to picture the terrific glaciers of the last ice age forming in the high mountains, then scouring the U-shaped walls of Tenaya Canyon and the better known Yosemite Valley below. Nevada Falls, Liberty Dome, Mount Broderick, and Half Dome towering in the background - most notably though, no smoke! Glacier Point Road was closed, but that wouldn’t stand in the way of our South rim plans. 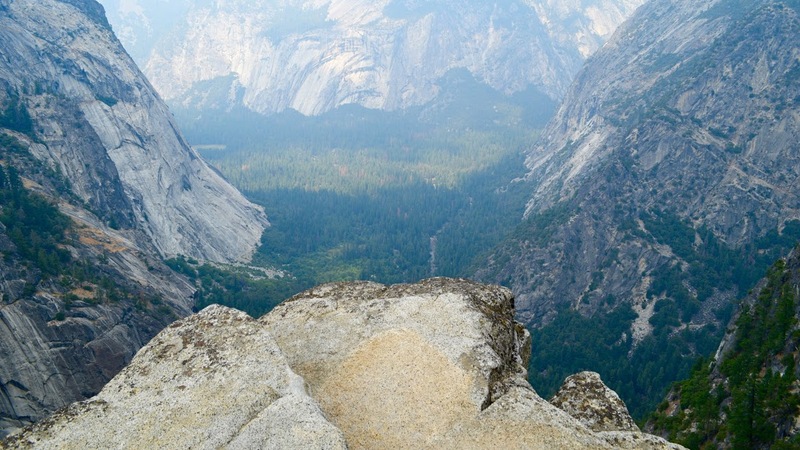 We climbed to Glacier Point from the valley floor and enjoyed our best views of the valley to date. The smoke hadn’t moved in yet and the morning was cool and crisp, perfect for climbing at an aerobic tempo. Glacier Point was busy, but we found much quieter trail once we moved on. The next few hours on the Panorama Trail offered some of the very best views we’d seen all week. Our trail later intersected the John Muir Trail in the Merced Canyon and we got to revisit that spectacular place in clearer conditions. It was a great hike and fine way to cap off a fun week in the park. I was very pleased with our trip. 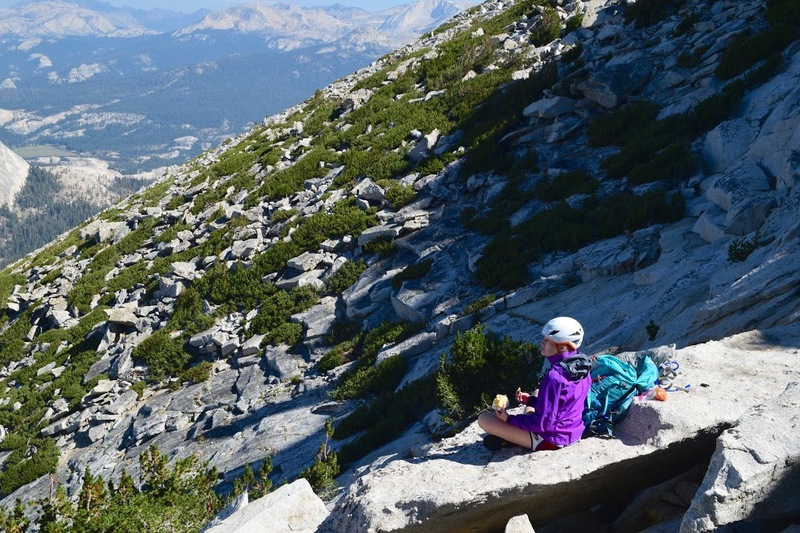 Michelle and I bit off a good sized chunk, but it was great to learn that a summer of cascade climbing had adequately conditioned us to move the way we did. We got to sample so many different dimensions of the park and feel like we really came to know it, even if only briefly. 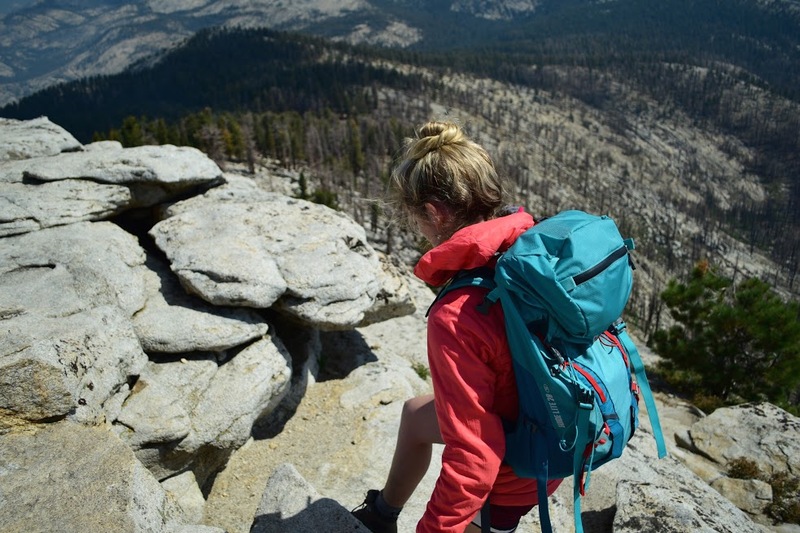 Every evening we dumped out our daypacks and re-evaluated what we’d carry the next day. It was tedious to be sure, but as a result, we packed carefully and tailored our kit to each of our outings. This meant reviewing the maps and route descriptions, looking for choice water sources, and deciding which layers and how much food to bring. Covering all our logistics at camp the night before made our mornings quick and our days rather straightforward. Carrying a water filter or treatment solution offers you a lot of room to shave weight and travel lighter. For instance, knowing there’d be water on the rim, I’d leave the car hydrated and carry only 0.5L or so up and out of the valley. I wouldn’t miss it, and most importantly, I wouldn’t be toting the extra weight thousands of feet up the canyon. 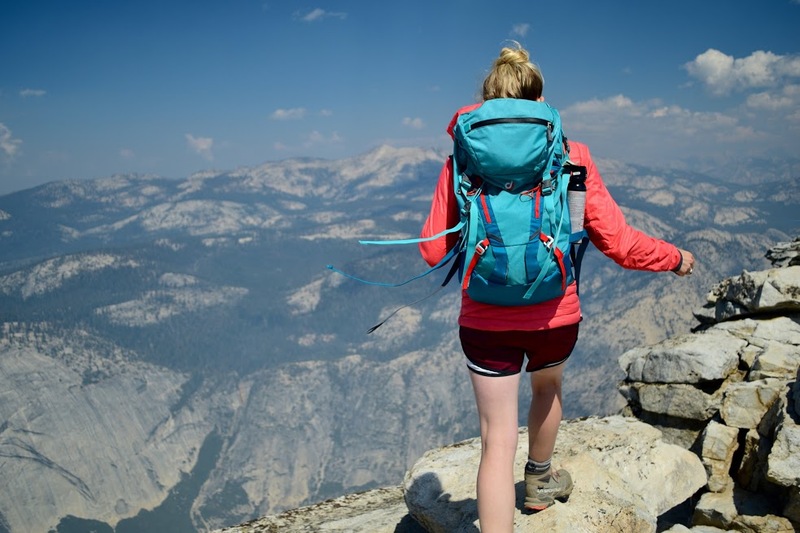 This strategy worked great up Half Dome, on the North rim, and on the Panorama trail – all of our longest hikes. It’s important to note where the last suitable sources are and to plan accordingly, but that careful planning definitely payed off. Finally, It’s good to plan and itinerize, but best to remain opportunistic. I’d packed a highly specialized climbing rack for Snake Dike, which would have been great if we’d climbed Snake Dike. I left behind our larger gear and some key components of our trad climbing and alpine climbing kits. If I’d just packed a bit more, we’d have vastly expanded our opportunities. From climbers in the valley we learned about some great moderate dome climbs and classic cross-country high routes that we hadn’t encountered in our trip preparations at home. Besides instances like these, smoke and fire closures influenced our choices. It was invaluable to have more objectives on the list than days to tick them off – as well as books and resources to shift gears as conditions or preferences decided. 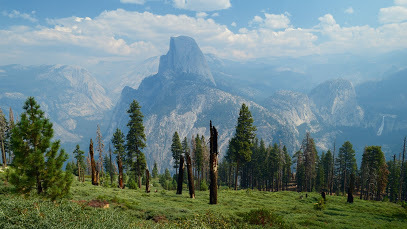 There are a lot of great choices for how to spend a week in Yosemite, but I’d say that day-hiking and seeing the park on foot is right up there with any of them.